How would you like to eat Khow Suey? 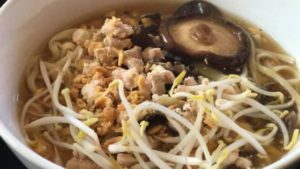 If you are a fun of soup, there are plenty of Khow Suey prepared as a soup. Or, if a cool salad is your thing, there are plenty types of Khow Suey salads. 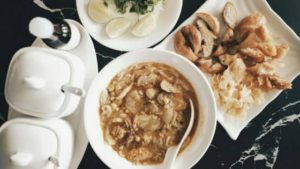 Different types of Burmese Khow Suey require different cooking methods, and some of the methods are simple but some are complicated. These Khow Sueys are wonderful to enjoy as breakfast, lunch, or dinner. We have brought to the different kinds of Burmese Khow Suey and how they are prepared. Thin rice noodle is used to cook Mont Hin Khar Khow Suey and it is served with Fish soup. Mont Hin Khar is one of the most favorite breakfasts in Myanmar. This Khow Suey has sweet taste of fish and the smell of it can make you feel hungry. 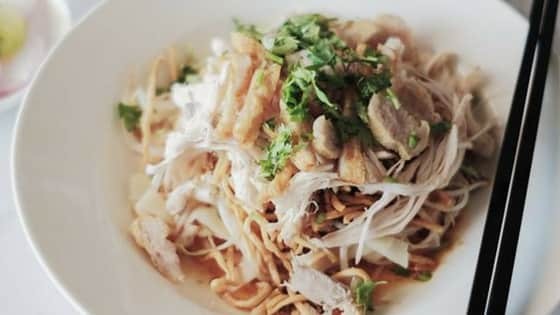 Not just the smell of this Khow-Suey is attractive, the delicious looking Mont Hin-Khar can attract the people as well. Preparation of Mont Hin Khar is complicated and it takes quite a long time to cook. Since there are variety of ingredients, the taste of fish soup is unique and delicious. if you would like to try Mohinga, here is our guide to make Mohinga at home. Nan Gyi Thoke is Khow Suey salad mixed with chicken curry with other ingredients. It is a popular breakfast, lunch or snack in Myanmar and originated in Mandalay. Thick rice noodle is used, and this noodle has small, medium and big size. This Khow Suey salad does not require any special sauce and it is only made with chicken curry. Nan Gyi Thohk is usually served with topping like crispy fritter, fried pea, fish cake and boiled egg. A bowl of Nan Gyi Thohk can be very filling and the wonderful taste is unforgettable as well. If you want to try Nan Gyi Thoke at home, here is our guide to make Nan Gyi Thoke. Shwe Taung (Khout Swal) Khow Suey and Nan Gyi Thohk are quite similar but slightly different. Nan-Gyi-Thoke is known as rice noodle-salad with chicken while Shwe-Taung-Khow Suey is known as egg noodle-salad with chicken and coconut. Egg noodle is used to make Shwe Taung Khow Suey salad and chicken curry is cooked with coconut milk. After that, a handful of egg noodle is mixed with coconut chicken curry. It tastes sweeter than Nan Gyi Thoke and has sweet coconut smell. Rice-noodle is used to cook Myay O Mee Shay and it is Khow Suey soup with the variety of ingredients. A bowl of Myay O Mee Shay is filled with chicken, quail eggs and a bunch of vegetable. Myay O means clay pot, therefore Myay O Mee Shay is usually served with mini clay pot. There are other type of Mee Shay khow suey soup and Mee Shay Know Suey salad. The style of cooking is different based on geograp hical regions. 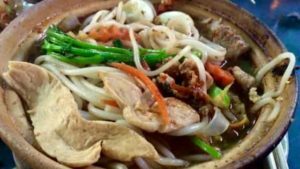 Shan Khout Swal (Shan Khow Suey) is originated in Shan State and it is one of the most popular breakfast in Myanmar. 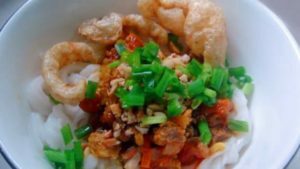 Thin rice noodle is used and it is a delicious khow suey salad. Chicken or pork is normally used and shredded meat is cooked with soybean gravy. A bowl of Shan Khow Suey can be very filling. Kaw-Yay-Khow-Suey is also known as gooey khow-suey because corn starch is used to make the noodle soup very thick. Egg noodle is usually used to make Kaw-Yay-Know-Suey and Burmese traditional Ngapi Htong is the side dish of this khow-suey. Fantastic web site. Lots of useful information here. I am sending it to some buddies ans additionally sharing in delicious. And naturally, thank you to your sweat!